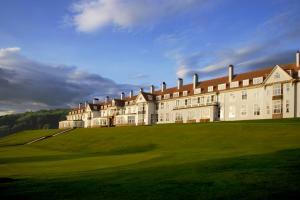 Choose from 39 hotels and guest houses in Ayrshire. Shown below a just a selection of the hotels available. To search within an area please use the menu on the right. 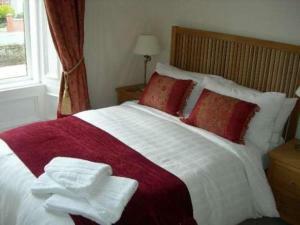 The Berkeley is a small, cosy and stylish hotel a minutes walk from Ayr town centre and a 2-minute walk from the beach. Built in 1803, the Grade B listed Georgian building is owned and run by a friendly, helpful family. Bedrooms have special extras including dressing gowns and slippers, and GHD hair straightners and heated rollers upon request. Most rooms have a DVD player built into the flat-screen TV, and there are DVDs to borrow. Breakfast features fresh local produce from Ayrshire and can be eaten on the terrace in summer. Or, you can enjoy breakfast in bed. In autumn there is an early dinner menu of traditional Scottish dishes (between 17:00 and 19:00). Book a table for 2 and receive a complimentary bottle of house wine. Contemporary, unique and luxurious accommodation in the heart of beautiful, rural Ayrshire. A perfect choice for the business or leisure traveller, offering excellent value and only 20 minutes from Glasgow. 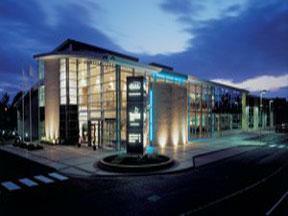 Built in June 2002, this unique 4-star hotel incorporates the Ayrshire Banqueting and Conference Centre, offering free wireless Internet access, 50 executive twin/double bedrooms, all en suite with tea/coffee making facilities, satellite tv, in house movies and direct modem point, ideal for the business and leisure traveller. Residents enjoy complimentary use of the Kilmarnock Fitness Centre, Kilmarnock Football Clubs very own health suite, offering a wide range of impressive equipment. The Cafe Bar serves light meals and refreshments throughout the day, and Blues Restaurant offers excellent cuisine in modern, relaxed and informal surroundings. The Conference and Banqueting Suites are unrivalled, providing state of the art facilities for up to 350 guests for a banquet, and 600 for a conference. There are four private suites within the hotel, and a further three smaller rooms within the stadium itself, ideal for use as syndicate rooms. We offer a range of packages, including Day and Residential Conference, Corporate Hospitality, Leisure, Golf Breaks, Team building, Theme Dinners, and all at competitive prices. 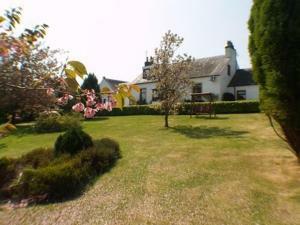 In a peaceful yet convenient location, this 19th century farmhouse is close to the A78 and approximately 15 minutes from Prestwick Airport and 40 minutes from Glasgow International Airport. Local train stations and major road links to Glasgow, Troon, Kilmarnock, Ayr and Largs can be accessed easily. The beautiful harbour-side area is 5 minutes' drive away and is adjacent to Irvine Beach Park, Magnum Leisure Centre and the popular Bridgegate shopping mall. There are 5 golf courses within easy reach of the Lodge: between 0.8 km and 40 km away. Transport to and from the courses is available. Nethermains Lodge is run informally and you can come and go as you please. Each room has en suite or private facilities. There is ample free private parking within the grounds, which is covered by CCTV. The family-run Appletree offers a warm welcome, free parking, free Wi-Fi and an excellent breakfast, all just 2 km from Prestwick Airport and 1 km from the train station. Express bus routes to Glasgow and Edinburgh are 200 metres away and both Prestwick town centre and the seafront are a 5-minute walk away. Appletree has been refurbished, but maintains many of its 19th-century features and has a large garden. All rooms on the ground floor and feature an LCD TV/DVD/CD combo, built-in Freeview and an iPod dock Old Prestwick, St Nicholas and St Cuthberts golf courses are within walking distance, and championship courses are a short drive away. A swimming pool, 2 fitness centres, cricket, tennis and indoor bowls are 500 metres away. 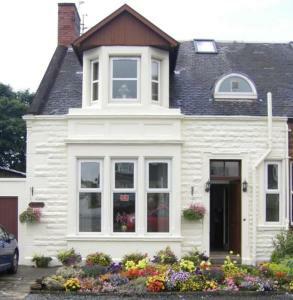 With free parking and free wireless internet access, this beautiful Victorian property is located in Ayr, 15 minutes from Glasgow Prestwick Airport, with private transfer services available. Chalmers is 5 minutes from Ayr bus and railway stations with a free pick-up and drop-off service offered. Private transport to and from Glasgow Prestwick International Airport is available 24 hours a day and can be arranged by contacting Graeme or Ann at Chalmers. The bed and breakfast is within walking distance of Ayr's excellent shops, bars, restaurants and the lovely sandy beach. Chalmers is also just 15 minutes' walk from Ayr College and the West of Scotland University campus. 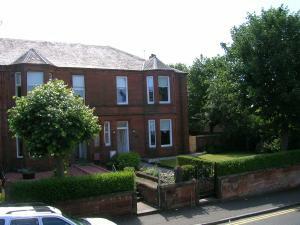 Ideally located, easy traveling distance from Prestwick Airport. 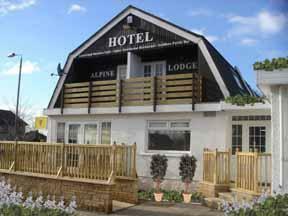 The Alpine Lodge puts you close enough to everything. The prime location provides easy access to Prestwick, Glasgow & the Highlands. We pride ourselves on our dedicated attention to detail and our friendly professional customer service. Our beautiful bedrooms are all new and en-suite, our restaurant and function suite have both been re-fitted to the highest standard from scratch and our bar area's fully re-fitted. The Alpine Lodge offers an elegant space for corporate meetings or special events from 18 to 220 people. Our restaurant is the ideal place to come to when your looking for a special dining experience. Our head chef, formerly of Turnberry, has created our menu to suit everyone's tastes. From a traditional 'Steak & Ale Pie' to more adventurous dishes we are sure you won't be disappointed. We're situated in a beautiful area in the Ayrshire town of Kilmarnock, where there is much to explore. We offer our guests a friendly and relaxed atmosphere throughout their stay with us. Situated on the South West coast of Scotland, there is much to do during your stay. The town of Kilmarnock offers one of the largest pedestrianised shopping centres in Scotland. Within the town there is also a museum, an art gallery and a large library, all of which are a great sight for visiting. The town is only 35 minutes by car from the contrasting city of Glasgow for those who wish to explore the region. 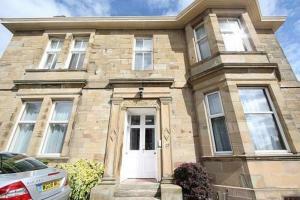 This also means that it is convenient as it is very near to Glasgow airport. The Arran ferry is also very close, a mere 20 minute drive from Kilmarnock. Belvedere Guest House offer comfortable, relaxed accommodation from an elevated position. Enjoy a wonderful view across Brodick Bay towards Goat Fell. The private guest house has an in-house clinical aromatherapist, hypnotherapist, reflexologist and Reiki master. Optional one-to-one personal exploration in complete confidence can be made available. 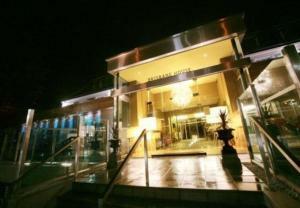 The Belvedere serves quality cuisine and can cater for vegetarians. Overlooking Ayr's seafront promenade, just metres from the town centre's shops, restaurants and nightlife, the Ramada Ayr has an on-site health club, a bar a restaurant and a 'Full Swing' golf simulator. The Ramada Ayr boasts great leisure facilities, including the new golf lounge and simulator, situated on the lower ground floor. The simulator allows you to enjoy 50 courses over 5 continents and the Ramada Ayr is currently the only hotel in Scotland to offer this exciting new facility. The Sebastian Coe Health Club has an indoor heated swimming pool, a spa pool, a jacuzzi, a sauna, a steam room and a fitness suite. Ayr Racecourse is just 1 mile (1.6 km) away. Regular races include the Scottish Grand National and the Gold Cup. There are 22 golf courses within a 20-mile (32 km) radius. The Arts Bar has speciality coffees, lunches and light snacks. The Arts Restaurant offers modern and traditional dishes. Peacefully set within a modern 2 storey villa, within easy reach of Irvine, Troon and Kilmarnock, this hotel presents itself as the ideal base from which to explore the many local attractions. On the west coast of Scotland, Kidron is within minutes of beautiful rolling countryside, with over 30 golf courses within a 20-minute drive. Furthermore, there are endless cycle routes through the countryside, connecting up with the nearby towns. Here at Kidron, proprietors the Macinnes family, natives of Ayrshire, offer an informal, friendly, home-from-home in which you can relax and enjoy yourself, whether you stay for a night or two, a short break or for a longer holiday here in Scotland. Situated on Prestwick seafront, this family-run hotel boasts a convenient position adjacent to Prestwick and St Nicholas Golf Clubs and within a 5-minute walk of the train station and town centre. Enjoying spectacular views across the Isle of Arran from the beautifully landscaped lawns, the Parkstone Hotel provides the perfect setting for your special occasions. Inside, the hotel provides multi-function rooms, including the Wedding Suite and Ballroom. Located in the heart of Ayrshire golfing country, the Parkstone provides the ideal base for golf enthusiasts. Adjacent to the hotel you will find Prestwick Golf Club and Prestwick St Nicholas Golf Course, whilst just a short drive will bring you to the Open Championship Courses of Turnberry and Royal Troon. 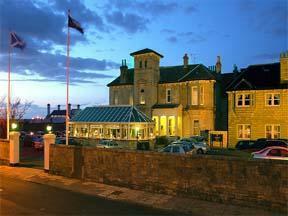 The hotel has a 3-star grading from the Automobile Association and Visitscotland. Located just outside Irvine, Ayrshire and only seven miles from Prestwick airport, this newly refurbished hotel is perfectly placed for both business and leisure. With an excellent selection of function rooms, ranging from executive boardrooms to a suite seating up to 300, the Menzies Irvine can accommodate a wide range of meetings, conferences, wedding receptions and private dinning requirements. The hotel has 128 bedrooms including executive rooms, spacious lounge bar, stylish Brasserie restaurant and 9-hole golf course. Close to Irvine's sandy beach, the railway station and the shops, this family-run bed and breakfast is just 10 minutes from Glasgow Prestwick Airport and offers a free shuttle service. When staying a minimum of 2 nights, the Harbourside Hotel - B&B offers a free courtesy bus service from and to the airport, between 08:00 and 00:00, 7 days week. The bed and breakfast has a great location, just a matter of metres from Irvine Railway Station, the Rivergate undercover shopping mall and the town's shops, bars and restaurants. Irvine's picturesque sandy beach is just a short stroll away. The Harbourside specialises in golf and whisky tours of the area and is located next to Glasgow Gailes golf course. All of the en suite rooms have TVs, videos, fridges, microwaves and tea/coffee making facilities. Free Wi-Fi is available in most of the rooms. Breakfast is included in the price. Superbly situated on the Ayrshire Coast, Turnberry Resort offers a luxurious spa, restaurants and golf courses, with striking views across the beach, Mull of Kintyre and the Isle of Arran. All of the elegant, spacious rooms have a flat-screen satellite TV and some rooms have spectacular ocean views. Free Wi-Fi internet access is available. Guests may enjoy an exquisite menu in the stylish 1906 restaurant, with grand sea views. Relax in The Grand Tea Lounge or enjoy a drink in the sophisticated Ailsa Bar. Duel in the Sun serves drinks and snacks, with plasma-screen TVs and a snooker table. The decadent spa offers a wide range of relaxing ESPA treatments and overlooks stunning ocean views. The spa also boasts a swimming pool, Technogym Fitness Studio, whirlpool and beautiful outdoor terrace. The venue for the 138th Open Championship, Turnberry A Luxury Collection Resort offers world class golf on the Ailsa, Kintyre and Arran courses. There are exceptional teaching facilities in the Colin Montgomerie Links Golf Academy. On the outskirts of Troon, Lochgreen House Hotel is wonderfully situated in the heart of quiet, secluded Ayrshire countryside amid 30 acres of woodland and gardens. The hotel was voted by the AA as 'Scotland's Hotel of the Year' in 2004 and 'AA Inspectors' Choice' Red Star Hotel in 2006. Following a loving restoration, the stunning mansion house offers elegant interiors in a grand setting of manicured borders and lawns. The restaurant and brasserie offer high quality food, and rooms are spacious and well equipped. Some rooms have views over the immaculate gardens and others have views towards the sea. Close to the town centre and Ayr Racecourse, this small, family-run hotel is just metres from Newton-on-Ayr Railway Station and within easy reach of Glasgow Prestwick Airport. 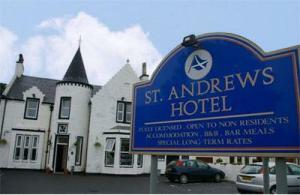 The St. Andrews Hotel has a convenient location between Ayr's town centre and Prestwick. Ayr Racecourse is just 0.6 miles (1 km) away and Northfield Bowling Centre and the many world-class golf courses in the area are also within easy reach. The station offers direct rail links to Prestwick and Glasgow. There is also a direct bus service with a stop directly outside the hotel. 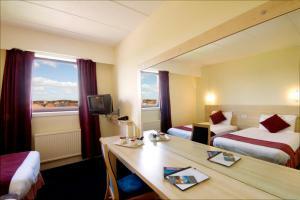 The well-appointed and comfortable en suite rooms provide good, clean accommodation at a competitive price. There is a comfortable lounge bar showing live sports and hosting pool and darts competitions, as well as a weekly karaoke night. The dining room can seat 20 and serves breakfasts and meals during the day. Free private parking is available on site. Less than 10 minutes from Glasgow Prestwick Airport and within easy reach of Ayr Racecourse, Express by Holiday Inn Ayr offers comfortable modern hotel accommodation at great-value rates. Just 2.5 miles (4 km) from the airport, the hotel's convenient location, free parking and good access to the region's major road network makes it a great base, whether you are exploring Ayrshire and Burns Country or just visiting the region on business. Ayr Racecourse, home of the Scottish Grand National and the Ayr Gold Cup, is just minutes away and some of the finest golf courses in Scotland are also within easy reach, including Royal Troon, Turnberry and Old Prestwick. The hotel is adjacent to Heathfield Retail Park and just 5 minutes from the town centre of the vibrant Scottish seaside town of Ayr. 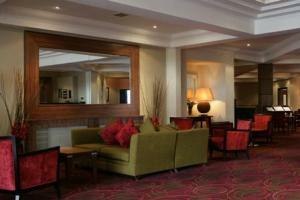 The hotel offers high-quality accommodation in fresh, modern rooms. The great-value rates include a buffet-style continental breakfast. In a beautiful, peaceful setting, on the banks of the River Doon, famous for its salmon fishing, these charming lodges offer bed-and-breakfast or full self-catering accommodation. Four miles (6.5 km) from the market town of Ayr, Kilmore Lodges consists of two cottages and an authentic log cabin all surrounding the same courtyard. All of the accommodation has en suite bathroom facilities and facilities for self-catering. Ayrshire is the home of Scotland's national poet Robert Burns and the area inspired many of his poems, including "Ye Banks and Braes o' Bonnie Doon." Burns' thatched cottage and heritage park are close by in Alloway Village. Keen walkers and cyclists can explore the beautiful countryside of Ayrshire. Standing proudly within Ayr town centre, this hotel with free car parking and Wi-Fi is the place to stay whether on business or pleasure. Comfortably furnished and well-appointed, the Ayrshire and Galloway Hotel offers affordable rates, and nothing is overlooked. Guests can enjoy traditional fare in the Badge Bistro or opt for something with a Mediterranean twist from the Meridian Cafe Bar situated right next door. Enjoy a walk along the promenade, discover 'Rabbie Burn' country, horse racing, golf or just enjoy the pastimes in the surrounding areas. On the ground floor you will find the reception, the bistro and the Shire Bar. The Shire Bar is a warm, welcoming place where you can enjoy a hearty dram in front of an open fire. Barcelo Marine Hotel is housed in a grand building with magnificent views over the Firth of Clyde to the Isle of Arran, overlooking Royal Troon Golf Course. The hotel boasts a wealth of leisure and fitness facilities, including a modern fitness suite, sauna Jacuzzi, steam room, indoor pool and beauty salon. 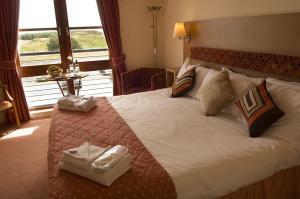 All rooms are modern and comfortable, some with views of Royal Troon. 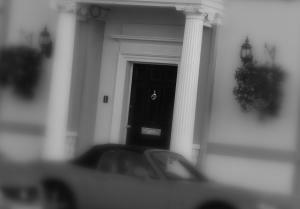 All rooms have wireless internet access and a classic white marble en suite. There are an abundance of premium quality golf courses within easy distance of the hotel. Barcelo Marine Hotel is only 10 minutes away from Prestwick Golf Club. The excellent Fairways Restaurant is open for breakfast, lunch and dinner whilst The Arran Bar Lounge offers light snacks throughout the day. A warm welcome awaits you at this privately owned 4-star hotel, a fully restored and refurbished Victorian mansion house situated on Ayr's seafront, recapturing the essence of country house hospitality. 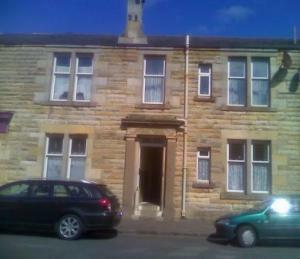 Great care has been taken to preserve the unique character of this charming house, whilst every modern facility has been discretely installed for the comfort of today's discerning traveller, with easy access to the nearby Glasgow Prestwick Airport. The hotel offers a fully equipped leisure club with swimming pool, sauna and steam room, gym and in-house beauty therapist. All the en suite rooms are beautifully furnished and decorated to a standard one would expect from a 4-star hotel. The creation of additional bedrooms results in an excellent balance between old and new. The new Martins Bar and Grill restaurant was voted Best Informal Dining Restaurant in Scotland at the Scottish Hotel of the Year Awards in 2006.